Uttar Pradesh Subordinate Service Selection Commission (UPSSSC) Gram Vikas Adhikari (VDO) Recruitment 2016. Those Candidates are Interested to the Following Recruitment and Completed the All Eligibility Criteria, can Read the Exam Date, Age Limit, Eligibility, .Also Read the Full Notification Before Apply Online Application Form. 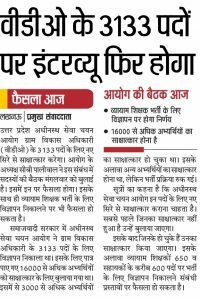 All Important Information Announced when UPSSSC will be Announced like Examination Date, Admit Card, Answer Key, Result , Syllabus. Download UPSSSC Gram Vikas Adhikari VDO Admit Card. How the check the registration being applied in 2013-14 vdo ,now current application get notices that thre is no need to apply ,wwho already submitted their forms in 2013-2014 tennure . pls suggest me,what i confirm our registration in upsssc . iska Admitcard kab aayega . Mr Mohit singh—-Syllabus will be announced 11 May and expected examination in June. Sir my name is RAM MOHAN my DOB is 05/08/1994.and my VDO registration no. is 51400165849. I fill up vacanics vdo of 3133 feb..2016. Sir I can’t download my admit card Sir pls tell me what I happened…. Sir…. I have cleared the every step of VDO examination 2016 but I didn’t get any information about the final result.Can you please inform me that whenever it will be finalize.